This page provides information on the overall design of the project, including study sites, treatment methods and sampling design. A more comprehensive description is available in The Hardwood Ecosystem Experiment: A Framework for Studying Responses to Forest Management. Study sites are spread over Morgan-Monroe State Forest (MMSF) and Yellowwood State Forest (YSF) in south central Indiana. MMSF is over 9,712 hectares in Morgan and Monroe Counties, and was established in 1929. YSF encompasses over 9,439 hectares of Brown County and was established in 1940. Nine HEE Research Units were established in MMSF and YSF in 2006. Each unit has a central research core area and a buffer area around this core. The units were created using existing Indiana Department of Natural Resources Division of Forestry management tracts. Each research core is comprised of 2-3 management tracts, and tracts adjacent to these cores are designated as buffers. The size of the research cores and their buffer areas range from 364 ha (900 acres) to 405 ha (1000 acres). The 9 management units were randomly drawn from 11 possible areas. Each of the 9 units was then randomly assigned to a treatment, with 3 units assigned as control units, 3 to even-aged management, and 3 to uneven-aged management. The three units assigned as the controls receive no harvest or burn treatments in the 200-acre Research Core for the duration of the study. The control units are used to monitor variation in plant and animal populations and communities in the absence of active forest management. Uneven-aged management within the designated Research Cores consist of four 0.4 ha (1.0 ac), two 1.2 ha (3.0 ac), and two 2 ha (5.0 ac) openings. In the remaining area of the uneven-aged research core, single tree selection with a target basal area of 16.1 – 23.0 m2/ha (70 – 100 ft2/ac) was harvested. Single trees are not harvested within 15.2 m (50 ft) of the harvest area boundaries to avoid expanding the size of the openings. The harvest design for the uneven-aged Research Cores were designed in consultation with HEE researchers. This treatment was designed with the intent of replicating the current silvicultural practices used at Morgan-Monroe and Yellowwood State Forests. Management within the even-aged Research Cores consists of 4-hectare (10-acre) openings using clearcut and shelterwood harvesting methods. Four openings were created; two openings were clearcut and two were harvested as shelterwoods. The return interval for each opening will be 100 years. 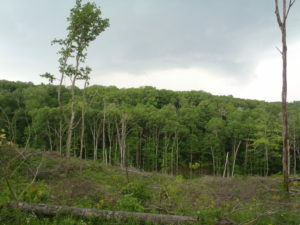 Timber was posted for closed bid on April 17, 2008 at Morgan-Monroe State Forest. To account for the variation in logging techniques (machinery, ​etc. ), the units were divided up into blocks which include a control, an uneven-aged, and an even-aged management unit (Table 1). The Morgan-Monroe Block contained a total of 742,149 board feet of timber marked for sale. Yellowwood West had 425,978 board feet. Yellowwood East had 442,334 board feet. Timber was sold in blocks, and the buyer agreed to use the same crew on both the uneven- and even-aged units within the block. Buyers were asked to begin harvesting as soon as possible. Uneven-aged unit harvests had to be completed and closed prior to harvesting in the even-aged unit. All harvesting had to be completed and closed by February 28, 2009. Best Management Practices were to be followed when applicable. Table 2 shows the approximate start date and close date for each unit. To monitor the growth and condition of the forest over time, a total of 716 vegetation inventory plots were established across the nine HEE research units on a 75 x 150 meter grid. A broad range of data has been collected at each plot including the diameter, species, light field, strata, condition, and location of overstory trees. Similar data has been collected for saplings within the plots. In addition, decay class, height, and species is recorded for all snags (standing dead trees) within the plots. Data concerning herbaceous plants and seedlings is also recorded at these same plots. Full inventories of all plots are designed to follow a four-year schedule. Over time, this data will be used to calibrate regional growth and yield models, validate remotely sensed data, and be related to habitat analyses for wildlife and insect communities. Species selected for study include a range of vertebrate taxa that represent both species of management concern and species indicative of microhabitat conditions and successional stages. Selected forest vertebrates are monitored before and after management treatments to determine the impacts on individual, population and community levels. Surveys of breeding birds, small mammals, bats, and amphibians will target selected species of interest, but data will be collected on all species detected. In addition to vertebrate species sampling, an important aspect of the project is the invertebrate component. Longhorned beetles and moth species are also being collected to determine the effects of timber management on their populations. Many attitudes and values toward forest management are held by stakeholders. We aim to better understand attitudes toward forest management practices and policies, to engage stakeholders and decision-makers in dialogue, and to design outreach programs aimed at affecting the attitudes and behavior of recreational visitors and landowners living adjacent to or near the Morgan-Monroe State Forest. The sample for this component of the research consists of neighboring landowners and recreational visitors to the forest.